We have nicknames for some of the gigs my band — Duke Rushmore — has played over the years. We have the Ice Gig, where the roads were so slick coming home one night after we played at a bar in a very faraway hill town that we were all sure we’d end up in a ditch at 3 a.m. in the morning. There was the Bug Gig, where the outside event turned into a mosquito fest, and we were the main entree, apparently. There was the Quiet Gig, where we played loud but the audience just sat there, like stones in their seats, and refused to dance. There was the Loud Gig, where the engineer for the venue cranked it so loud people had to leave the room. And now we have the Cold Gig. We played out last night at a brewery that does two-hour tasting (it is a real brewery, not a brew pub) and they have bands entertain the crowds drinking their homebrew beers. It’s a good gig, and we love playing there, which we do a few times a year. It’s a funky space — wide open floors, very little seating. You have to climb five stories of steep steps to get there (although the band uses the freight elevator). You rough it at this place. Last night was a bit more rougher than usual. The heating was on the fritz (meaning: no heat) and the outside temperature hovered around the single digits. It wasn’t so cold we could see our breath but it was close. It took all of my courage to take off my jacket to play, and my saxophone — that temperamental piece of metal — does not like the cold air. We wrestled all night for the right notes. Oh, and the only toilet in the place wasn’t working, so there were huge buckets of water to use to flush. Like I said, you rough it. But we had one the biggest crowds of the year there, with more than 160 people jammed into this tight space, dancing the cold night away to the music, and we warmed up quickly, jumping around and finding the groove, and it was a great night of music. 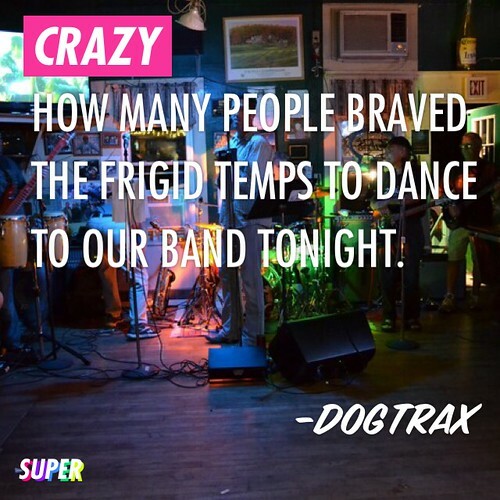 It was the Cold Gig, but we turned up the heat, and it was all right. Sounds like a good time in a place I’d love. I have a vision of an ice bar from a James Bond movie, the one w/ Halley Barry, in my head. I sense, however, that the place you played isn’t as glamorous. Wow! 160 people! If you live in a place that has had as much snow as we have this year, any bit of melting and warmth and I would have driven miles to a frigid bar to see a favorite band and get out of the house, too. So glad you gave people something to talk (and write) about. I hate being cold, but beer, music, and dancing sound like the perfect way to keep warm! Sounds like a lot of fun. My wedding many years ago was also a cold gig. Frigid December temperatures. The heat was turned up early afternoon in preparation for the ceremony. The church temp might have gotten up to 55 degrees. The love we created there kept us warm. I am sure the rhythm of the music and the dancing kept all of you warm. Thanks for the piece and for allowing it to recreate my own moment (which I will hold onto for a day when an idea doesn’t arise this month). And thanks for the poem you left at my site. I loved it. It’s all about perspective, isn’t it? Someone else would have groused about it, but I can “hear” the affection in your voice. Sounds like such a great time and fabulous memory! 160 people! Sounds fun to me. My husband and I have several friends who play in different bands. We try to get to their gigs as often as we can. this sounds like some place any of them would play. It sounds like a great time was had, regardless of the conditions. I want to hear you play someday my friend. I am taking my Saturday to go volunteer to pour beer at a Tasting Festival. Sunny here in San Diego. I should be doing lots of work, but taking a day to do something totally different. Love the image of you heating up the night air with the warmth and power of your music. Love the names you give to your gigs. They really invite the imagination to take hold. I am not a i musician but I have always been a bit envious of the good vibes you must feel when you have bee immersed in a night of music like the one you described. May you keep on giggin for as long as you can! I don’t know that I would like the Cold Gig or the flushing method, but I would love to hear your band. Very entertaining post! I can relate. I, too, have played the Cold Gig, with an orchestra in a school where the district was on strike – no heat. And the Mosquito Gig, with a band. That concert was cut short by attacking bugs. It’s hard to play when they flying into your mouth! I’m glad you got a big crowd in spite of the cold – that’s always more fun than the half empty hall.